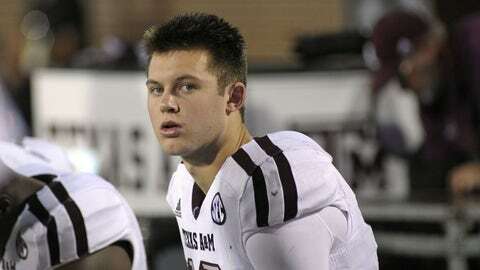 'It's about as important a decision as I can make in my life at this stage,' Kyle Allen said. Houston didn’t just win a New Year’s Six Bowl when the Cougars beat Florida State in the Peach Bowl last week, UH also snagged a former 5-star QB prospect. Kyle Allen, Texas A&M starter for most of the past two seasons, was watching that game intently as he weighed his transfer options. "That [Houston’s 38-24 win over No. 9 FSU] was the icing on the cake," Allen told FOX Sports on Tuesday after news of his transfer to Houston became official. In Allen, UH lands its apparent successor to Greg Ward Jr., who figures to be the Cougars starter while the guy considered by many as the nation’s top QB recruit two years ago sits out 2016. Allen, a sophomore, threw for 2,210 yards this season to go with 17 TDs and just seven interceptions, while completing 57 percent of his passes. "This was a pretty tough decision," he said. "It’s about as important a decision as I can make in my life at this stage." Allen said he had considered Oklahoma early on but noted that the Sooners opted to go in a different direction (taking fellow A&M transfer Kyler Murray, a freshman) and also had been hearing from Colorado, Colorado State and Syracuse. "On Sunday, me and my mom and dad sat down and did kind of a risk analysis, and we came up with Houston as the best choice. "I just have a lot of trust in Coach [Tom] Herman. He had recruited me in high school [when Herman was at Ohio State]. I had gotten to know him extremely well. I know he can really help me grow as a man and get to the NFL." Because of the timing of Allen’s transfer occurring during an NCAA dead period, he wasn’t able to visit any of the colleges before making his choice. A few days after he got back home to Arizona, his mom came to him puzzled when she found an online report claiming that he had visited Houston and met with Herman. "I was actually still in Arizona and haven’t left here since I got back from A&M Dec. 12," he said regarding the erroneous report. "I never got to see anyone [or any of the schools]. It was all just phone calls. "But at this stage, it doesn’t really matter to me what the stadium looks like or what the town looks like, I just want to go to a team where I can win and where we can win." After seeing how the Cougars handled Florida State to move to 13-1, he is convinced that Houston is the right spot for him. "They [Houston] played some good teams this year, but FSU was the best team they faced and they showed they belong." Allen will finally get to see Houston next Tuesday, when he flies back to Texas. He still has to go back to College Station to move all his stuff on to his new home.